Hinch graduated with a 4.0 grade average in high school where he was the starting quarterback and pitched some for the baseball team. Early in his pro career, A.J. spent a lot of his free time reading books, like "The Mental Game of Baseball," and "Men At Work." Hinch's father, Dennis, suddenly died of a heart attack on Feb. 8, 1993. He turned down loads of money from the White Sox when they picked him #2 in June 1992. He went to Stanford University instead. And he passed up on the Twins when they picked him #3 in June 1995, turning down $225,000. He preferred being captain of the U.S. Olympic team. In 1996, after graduating from Stanford, he signed with the A's, who had picked him in the third round. His bonus was $125,000. In 1997, A.J. was second in the California League in slugging (.583). During the offseason before 2000 spring training, Hinch worked with noted fitness guru Mark Verstegen in Phoenix. A.J. wanted to increase his athleticism and increase body control. Verstegen worked with Nomar Garciaparra when he was in the Red Sox minor league system and did wonders for him. Hinch said he was doing it to improve his entire career, not just the 2000 season. "I want to be the best that I can be," he said. In 2002, A.J. 's wife, Erin, contributed to a cookbook the wives of Royals' players put together for charity. A.J. and Erin celebrated the birth of their first child, Haley Kristen, September 25, 2002. A lot of baseball people see A.J. as a future high-level executive with a team. He is able to comprehend information very quickly. In November 2003, Alan Schwarz, senior writer for Baseball America wrote: "What he offers most is one heck of a head on his shoulders, one that soaks up information and experience and fits all the gears together into the whirring machine of his mind. He has the same crackling intelligence, charisma, and drive that another former journeyman, Billy Beane, had in 1990 when he gave up playing in his late 20s to join the Athletics front office. They even look and sound eerily similar." Schwarz also mentioned how A.J. is "realistic rather than emotional. He can take different views of things." During the offseason, Hinch monitors the transaction wire after the season as keenly as the standings during it, to see how GMs are putting together their clubs, whether they allocate their budgets toward a No. 4 starter or an arbitration-eligible shortstop. A.J. will certainly stay in the game after his playing career. A few teams already have Hinch in mind for front office positions, according to rumors. The Astros hired a 40-year-old A.J. Hinch immediately following the end of the 2014 season as their next manager, giving him a team with a mix of veterans, a promising young core, and some impressive newcomers as they try to get back to contention. A.J. 's mom, Becky, has been her son's biggest fan for over 40 years. That was true when he was a two-sport start in high school in Oklahoma and when he played in the Major Leagues for seven seasons, and it remained true when he was a baseball executive with the D-backs and Padres. Now that Hinch has found success in his second act as a Major League manager with Houston, his mother remains as much of a positive influence on him as ever. Hinch said his mother keeps up with the games from her home in Midwest City, Okla.
"I get a text message from her after good games, and she continues to be one of the greatest Astros fans out there," he said. "I didn't know how much my mother went through losing my dad until later in life when you have your own kids, own marriage," Hinch said of when his dad died suddenly died of a heart attack in 1993, his freshman season at Stanford. "My mom was married very young. She lost her husband at a very young age, and she's persevered to continue to be an influence for her grandkids and her kids. She's a very lovable woman, and she loves being around baseball. She's the biggest support system you could ask for." When Hinch was growing up in Oklahoma, his mother made sure he was everywhere he needed to be when it came to sports. If that meant driving long distances for a tournament or a practice, she did it without hesitation. She was there to pat Hinch on the back and make sure he was loved when things weren't going well, or to keep him in check when he was worrying more about baseball than he was science. As it turned out, he flourished in both the classroom and on the field. Hinch was a three-time All-American, and he earned a psychology degree from Stanford. "There wasn't a tournament she wouldn't take us to, there wasn't a practice she wouldn't sign me up for," Hinch said. "That kind of love and support, she wanted me to be happy. She knew baseball was part of it. She moved to Stanford with me when I was in college after I lost my dad, and she has remained my biggest fan through baseball and through life. She's a great woman who's gone through a lot." So when Hinch made his Major League debut as a player with the Oakland A's on April 1, 1998, going 0-for-3, mother and son shared perhaps the most important memory in a life filled with so many. In 2016, A.J. was named to the Pac-12 All-Century Baseball Team. The former Stanford catcher was one of three catchers named to the 30-man team by a 36-member panel. The team is made up of 20 position players and 10 pitchers, including former USC pitcher Randy Johnson. 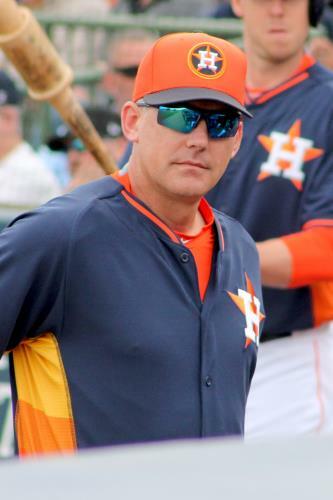 One of the people Aaron Boone leaned on heavily when trying to become a big league manager, something he eventually did when the Yankees hired him the 2017 offseason, was Astros manager AJ Hinch. AJ (Stanford) and Boone (USC) were on rival teams in college, and they were teammates on a Team USA junior squad. Boone's father, longtime big league catcher and manager Bob Boone, was instrumental in introducing catching to Hinch when he was a teenager. Bob Boone went to Stanford. "Had I known he was going to be good at this job I probably would have sabotaged," Hinch joked. "I have a lot of respect for him. His demeanor is showing well in an incredibly intense environment, and obviously the players have responded to him and he's doing some pretty good things. I haven't actually seen him at work, but I've talked to him a few times, and we share a lot of similar stories. There's 30 of these jobs. He's got one of them; I've got one of them, so there will be a brotherhood always." When Boone would come through Houston as an ESPN broadcaster, he'd always stop in Hinch's office and "chat like old friends," though Boone made it no secret he desired to be a manager. Boone said the conversations with Hinch are easy because of their similar backgrounds and ages. June 1996: He was drafted in the third round, out of Stanford, and signed by the A's. January 2001: The Royals sent OF Johnny Damon and INF Mark Ellis to the A's to acquire A.J., P Roberto Hernandez, and INF Angel Berroa. December 22, 2002: Hinch signed with the Indians. March 29, 2003: The Tigers sent a player to be named to the Indians, acquiring A.J. January 2004: Hinch signed with the Phillies' organization. He had good, but not great power. But he loved a fastball. Thus, pitchers fed him a lot of breaking pitches away. Hinch can make good contact and hit the ball into the gaps. He hits breaking balls pretty well. But good Major League heat? He had trouble getting around on it, lacking the bat speed. Hinch was a decent catcher with an excellent arm, but his release was inconsistent. Part of that is due to a chronically sore shoulder. A.J. called a good game. He had a fine, studious approach to the game and quick feet. He is a leader, with a take-charge attitude and excellent instincts and intelligence. And A.J. always builds a strong relationship with his pitching staff, building their trust. "You have to deal with pitchers on an individual basis. They're all such different guys, and a catcher has to know how to push their buttons to get them going," Hinch said. He called a game like a long-time veteran. In 1997, Hinch set a standard for fielding percentage behind the plate at .996 for the California League, making just 3 errors in 683 chances. In 1998, he threw out 34% of attempting base-stealers, 7th-best in the American League. But that fell off in 1999 when he was not very effective in throwing out runners. In 2003, A.J. only caught 3 of 26 attempting base-theives, a very poor 12 percent. Calling a game was Hinch's forte. Or at least that, and a strong relationship with his pitchers. He got the most out of them. "My job as a catcher is to make them the best pitcher that they are. The only way is to get their trust over time," A.J. said. The tribulations of Hinch's two partial seasons with the D-backs served him well. He was able to honestly evaluate what happened in Arizona and address those issues in Houston. A big part of that was realizing how important the human element was for the manager. When A.J. moved from the Arizona front office to the dugout, some still viewed him as a member of the front office, and it wasn’t easy. 2006: Hinch became the Diamondbacks' Director of Minor League operations. August 10, 2006: The Diamondbacks promoted A.J. to Director of Player Development. May 8, 2009: Hinch replaced Bob Melvin as Manager of the Diamondbacks. G.M. Josh Byrnes actually posed questions himself before reporters had the opportunity. "Why so unconventional?" Byrnes said. "Why did we choose A.J.? I'm happy to answer that." Byrnes then detailed the thought process behind making Hinch, formerly the club's vice president of player development, and giving him a contract that runs through 2012 despite Hinch never having managed or coached a single professional game. Byrnes described Hinch's involvement in upper-level decision-making within the front office over the past three-plus seasons, saying that Hinch's inexperience in the dugout is outweighed by his understanding of the team's philosophy and his "understanding what organizational advocacy is." "He's never done a double switch before," Byrnes said. "He knows what it looks like. He'll figure it out. He brings unique leadership and perspective to the job. We're not here to reinvent the wheel. But to change the nature of the job a little bit? OK, we'll do that. "A.J. is a leader and connects with people and gets why things are done and obviously is in one of the most prominent spots in our organization." July 1, 2010: The Diamondbacks fired Hinch with the team mired in last place in the NL West for the second straight season, with a 31-48 record. September 12, 2010: A.J. joined the Padres organization as head of their scouting department. And September 23, 2011, the Padres announced Hinch had been promoted to V.P/Assistant to the General Manager, while remaining as head of their pro scouting department. August 5, 2014: Hinch announced he was leaving the Padres. "During my time in San Diego, I dedicated myself to do everything I could to help this team win, in the short-term and for the long-term. These last several weeks were no exception," said Hinch. "I think the organization is ready for a transition and I've made a decision and told [executive chairman] Ron Fowler and [team president and CEO] Mike Dee that now is the right time for me to move on. "I'm proud to have always operated in the best interest of the organization and to have established long-lasting relationships with people who work on and off the field in San Diego. I wish the Padres and the new GM well in the future and look forward to the next chapter of my baseball career." September 29, 2014: A.J. was named manager of the Houston Astros, becoming the 18th dugout leader in the Colt .45s/Astros history. March 8, 2016: The Astros extended A.J. 's contract for an undisclosed term, but team owner Jim Crane said that Hinch "will be here a while." April 16, 1998: Hinch suffered a concussion while sliding trying to catch a foul ball near the A's dugout in Oakland. The ball hit him in the right temple and he lost consciousness briefly. July 18-August 3, 2003: A.J. was on the D.L. with a pulled left groin. August 6-31, 2003: Hinch was back on the D.L. after reinjuring that left groin.